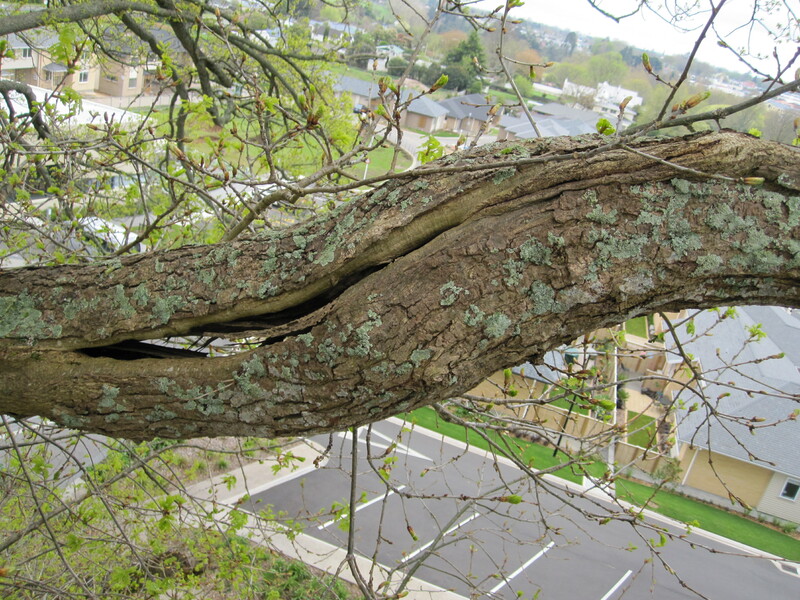 A tree inspection is a thorough and detailed inspection of a tree. The tree is inspected using scientifically proven assessment and analysis methods. Don’t get any tree worker or even a qualified arborist to inspect your trees. Most qualified arborists hold only an advanced certificate in arboriculture. This certificate contains very little training in tree inspection and consultancy. All tree consultancy work must be undertaken by a fully trained and qualified arboricultural consultant. A consultant must hold a Diploma in arboriculture – this is three years full time study of trees. Nathan Hughes, managing director of Groundzone Tree Care is a fully qualified arboricultural consultant. Not only does he have a Diploma in Arboriculture, he was awarded a distinction, so he definitely knows trees well. Nathan carries out all the consultancy work for Groundzone Tree Care. 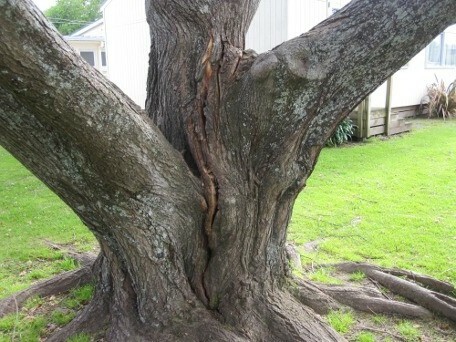 For peace of mind, know that your trees have been inspected by a professional consultant. Please click here to see proof of qualifications for Nathan Hughes, Arboricultural consultant. The tree being inspected using scientifically proven assessment and analysis methods. A written report is provided detailing the inspection process and findings. Practical recommendations are made to effectively manage any hazards or issues that may be identified. Many hazardous trees are not as obvious as the one in this photo! This involves the mapping and inspection of multiple trees on one property. The location of each individual tree is recorded on a site map. This is an excellent tree and hazard management tool for schools, councils and any property with a number of trees. Hazardous trees are clearly identified, and also any other trees requiring any kind of attention. Any necessary maintenance or hazard reduction work is clearly documented. A tree survey is a very good way to take all practicable steps to effectively manage a number of trees. We provide advice and guidance on excavation and construction work in the vicinity of protected and notable trees. We can provide clear, practical guidelines and qualified supervision to ensure protected trees are not harmed by excavation and construction work. We also provide written reports regarding proposed excavation and construction work in the vicinity of protected trees. These reports describe the trees, the location, and the proposed works near the trees. The reports are individually tailored to each individual tree and situation, and clearly state what can be carried out near and under the trees, and what can not be carried out near the trees. 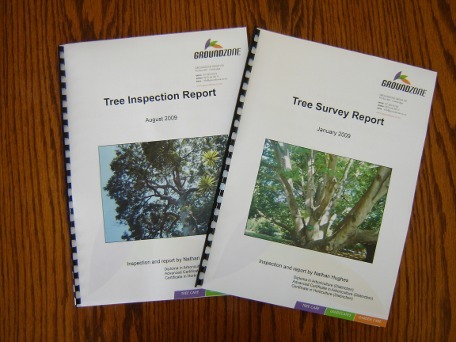 These reports are designed to be submitted to local councils and are often a requirement of a council before approval can be given for a project near a protected tree. Has your neighbour poisoned or damaged your tree? Is NZTA or another governing body forcing the removal of your trees for a new road or development? Have your trees been mistakenly cut down by a contractor, and only stumps remain? Do you want compensation? The value of a one metre high seedling is easy to prove – it simply needs to be compared to a similar size tree for sale in a tree nursery. A 20 metre tall tree is another matter – there are no trees of that size for sale in the country! To solve this problem, the arboriculture industry has developed several tree valuation systems for the various different scenarios. It is easier to value a tree when it is still standing, but there are some systems that can value trees when only the stumps remain. If you need your trees to be valued for any of the reasons above – we can help. Using industry standard tree valuation systems we can provide you with a simple, clear, and professional tree valuation report for your trees.